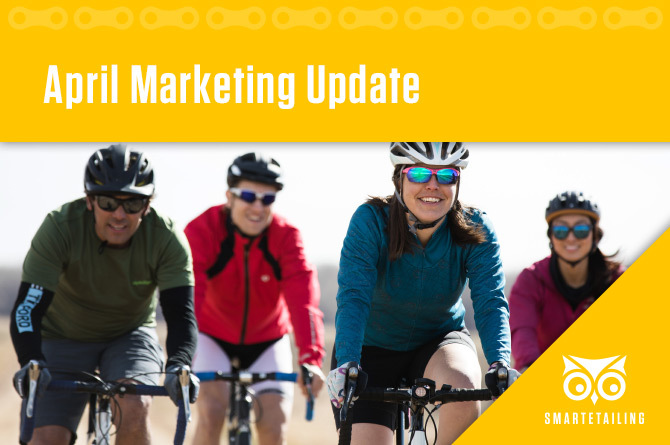 For most markets, the cycling season has kicked into high gear. For those out cruising in the beautiful April weather, we have promotions for spring apparel, as well as an Earth Day centered gear refresh. Build community with group rides this spring/summer to cultivate a loyal customer base. These marketing materials are designed to drive sales online and in-store. Don't see marketing materials for the product categories you want to promote? Reach out to our support team, or your marketing account representative, and they would love to help you get what you need to increase sales online and in store. Responsive home page highlights can now be found at the bottom of each corresponding landing page in the SmartEtailing Page Library. To access the new responsive highlights, go to Content Manager > Page Editor and click the “Page Library” tab. Choose your new responsive page and import it into your library by clicking the yellow icon in the Action column. You will be prompted to select a folder for the new page and given the option to set the imported page to active. Click the “Your Pages” tab and locate your new page. Select the Edit icon to open the page, then scroll to the bottom to find the responsive highlight content as well as detailed instructions for installation. Electric bikes continue to be a growth market. As the technology and variety improve you can expect even more questions from customers. This promotional landing page answers the two big questions around speed and battery life. Can be found in the Page Library under Shop Products > Bicycles > Electric Bikes - Why Ride? One of the big benefits of cycling is the positive effects it has on the environment. This marketing piece highlights this aspect and encourages your customers to refresh their accessories so they can ride even more. Offering discounts or product bundles would help drive home the benefits of shopping local. As spring winds down, clear some space for new summer apparel arriving soon. This would also be a good time to upsell consumable products like tubes and chain lube. Or suggest end of season maintenance. Shopping trends point to the fact that consumers buy into an experience before they buy a product or service. Use group rides as an offline way to build a community. Offer post-ride discounts or rewards for completing multiple rides. However you go about it, building a tribe around your shop will be key.